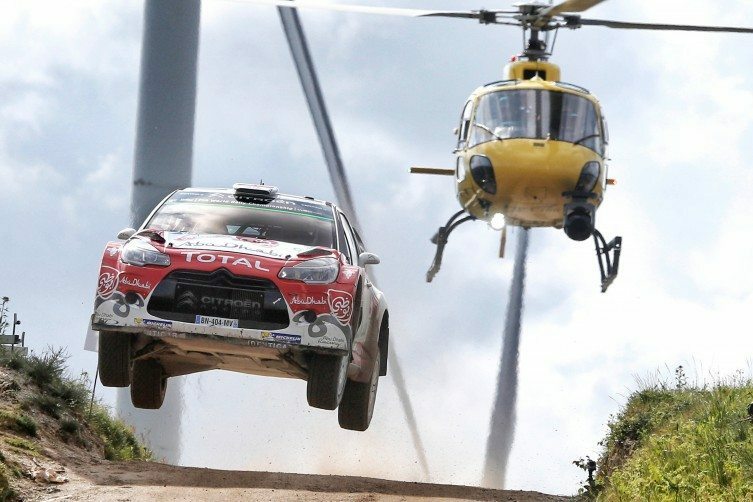 BRITON Kris Meeke ended a 13-week break from the FIA World Rally Championship with an emphatic win in Vodafone Rally de Portugal today (Sunday) – but hopes for an Australian podium result were dashed just minutes from the end of the four-day event. Meeke, who missed the previous two WRC rounds in Mexico and Argentina, led for all but the first of the 19 speed tests to win the championship’s fifth round in northern Portugal by 29.7sec in a Citroën DS 3. It was his second world success after triumphing in Argentina last year. Andreas Mikkelsen of Norway outpaced teammate Sébastien Ogier on the final day to take second in a Volkswagen Polo R, relegating the French triple world champion to the last step of the podium by 4.8sec. Third place was looking certain in the WRC2 category for the Australian crew of Scott Pedder and co-driver Dale Moscatt until a spin on the final Power Stage cost almost 18 sec. and lost them the position by just 0.2 sec. Fourth overall still equalled the 2014 Australian champions’ best result from their WRC2 debut last year in Finland, but after a stunning return to the 2016 series this weekend missing the podium so narrowly was a hard blow. Pedder had recovered from a rollover in his Skoda Fabia R5 in the unofficial Shakedown session on Thursday morning and punctures on Friday and Saturday. He had fought back from a low position of 18th on Friday, achieved his maiden WRC stage win yesterday and held third spot by 17.6 sec. going into the final test on the spectacular Fafe stage. With more than half a minute on Mikkelsen, Meeke, from Dungannon, Northern Ireland, had everything to lose and nothing to gain on the Power Stage and drove steadily to eighth spot. The stage was a lock-out for Volkswagen, with Ogier taking the maximum three bonus championship points, Jari-Matti Latvala two points for second and Mikkelsen one point for third. Ogier, despite not winning the previous two rounds, continues to lead the championship comfortably, but Mikkelsen displaced Rally Argentina winner Hayden Paddon from second. The Kiwi suffered a catastrophic retirement on Saturday when his car caught fire and was completely destroyed after a relatively minor crash. Meeke is now seventh in the championship, but not a serious contender as he conducts a part-time campaign while concentrating on the development of Citroen’s 2017 World Rally Car. “I have to say it was a really perfect weekend – textbook,” he said at the finish. “A huge thanks for my team and my engineer who did a lot of work for this rally. I couldn’t have done any more really. The championship continues with Rally Sardegna Italia on 9-12 June. Pedder and Moscatt will skip the island classic and resume their WRC2 campaign at PZM Rally Poland on 10-3 July. They also plan to contest Neste Rally Finland, Rally China-Beijing and Kennards Hire Rally Australia later in the year.